The old year ends with storm and snow. Snow fell last night and during much of today. 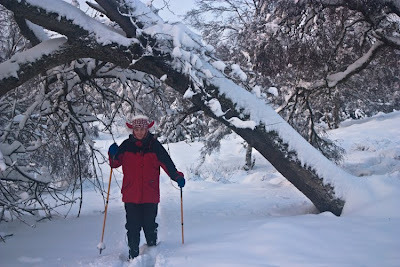 I wore snow shoes for a last walk of 2009 in the local fields and woods and still sank in shin to knee deep. Without snowshoes or skis progress would be extremely slow and arduous. Trees are weighed down with snow, their branches bent under the load. There was no wind and the woods were silent and still. Passing below the trees I was very aware of the great bosses of snow hanging above me. Lest I forgot twice I heard the sudden, sharp crack of a breaking branch and the gentle slither of the snow falling from it. Once I saw a big clump of snow crash to the ground, creating a cloud of snow crystals. Some of the snow is fresh powder, light and dusty, but some is refrozen, hard and icy, forming heavy blocks that could do serious injury if they landed on your head. I didn’t linger under the trees. 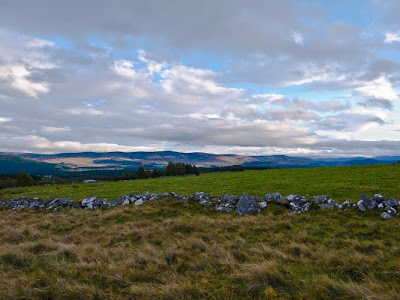 The hills were cloud-covered and the sky grey but at dusk there was some colour in the sky and a strange blue light over the land. As has been the case for nearly two weeks now the temperature never rose above freezing. Now at 7pm it’s -4ºC and a hazy full moon hangs in thin, drifting clouds. The forecast for New Years Day is more snow. Best wishes for 2010 to everyone. As the 2000s draw to a close I’ve been looking back at my outdoor activities over the last decade and thinking about some of the more memorable trips. The 21st century began in fine style in 2000 with a hike along the beautiful Arizona Trail, a two-month walk in desert, forest, mountain and canyon that was challenging and fulfilling. The next year I went ski touring in the Brandsetdalen region of Norway in the spring, traversed the Uinta Mountains in Utah in August (after attending the big Outdoor gear show in Salt Lake City) then did a circuit of Glacier Peak in the Cascades in Washington State in the autumn, a walk made special by the spectacular autumn colours. 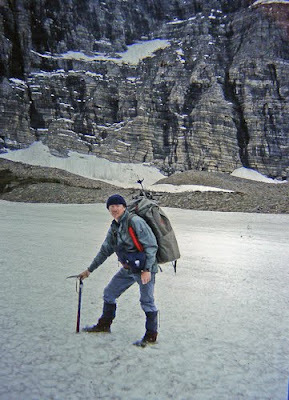 In 2002 I ventured north of the Arctic Circle for a ski tour in Sarek National Park in Sweden then spent 5 summer weeks on a circular hike in the High Sierra in California, a wonderful trip on which I slept under the stars almost every night. 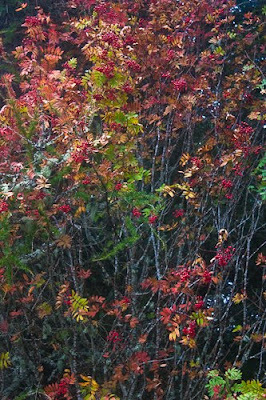 Dry weather didn’t allow for that on my two longest trips in 2003, a summer walk along the Southern Upland Way in Scotland and an autumn trip in the White Mountains of New Hampshire enlivened by wet snow blizzards. Stormy weather continued for a ski tour I led for the Inverness Nordic Ski Club (now the Inverness Skiing and Ski Touring Club) in the Halingskarvet region of Norway in the spring of 2005 though we did have a superb final day with sunshine and perfect snow for an ascent of the Hardangerjokul ice cap. 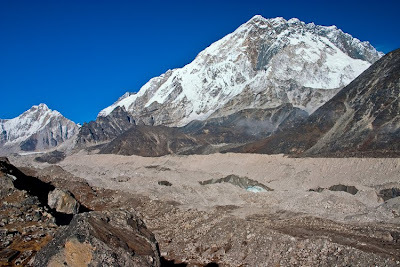 In the autumn I led the TGO Reader’s Trek to Makalu Base Camp in the Himalaya, a magnificent trek that is the finest of the three I have done in Nepal. In 2006 I hiked the rugged and rocky GR20 long distance route in Corsica with Cameron McNeish, an impressive trip in fantastic mountains though it is busy. Even more crowded is the trek to Everest Base Camp in Nepal, which I led for KE Adventures in the autumn. The mountains are stupendous but I’ve never done a hike amongst so many people. 2006 was the only year of the decade when I didn’t go abroad (though visiting the Western Isles almost felt like it). The last three years have seen ski tours in the Rocky Mountains of Wyoming – in Yellowstone in 2007 and 2008, the Wind River Range this year – during which we built and lived in igloos. As well as all these foreign trips I was also out most weeks in the Highlands on day walks and most months saw at least one backpacking trip. 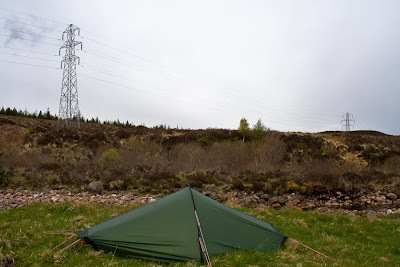 I spent two weeks in May on the TGO Challenge six times as well. 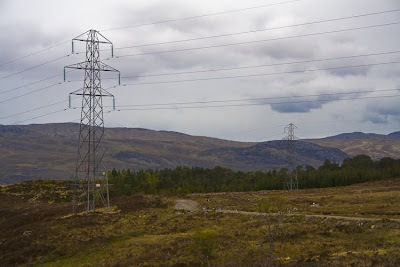 In the second half of the decade the Highlands became the focus of my writing and photography. 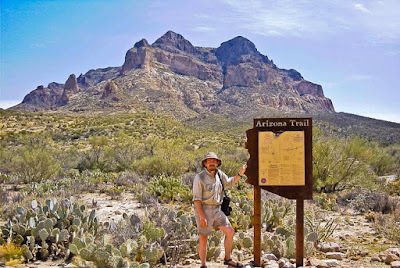 Crossing Arizona, published in 2002, told the story of the Arizona Trail hike and in 2005 the third edition of The Backpacker’s Handbook appeared but after that it was all Scotland. 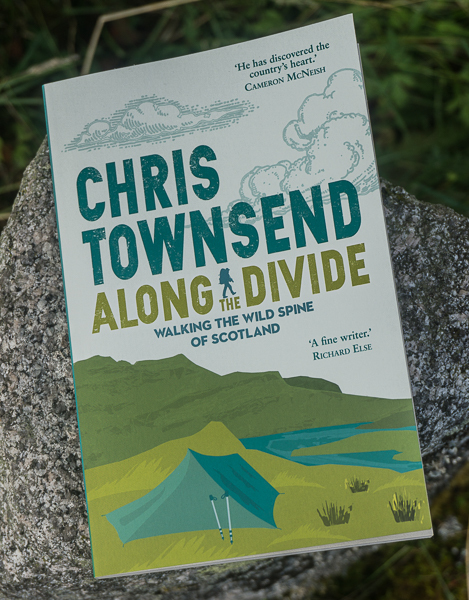 For the last six years my book work has been concentrated on a big Scottish Mountain Guide for Cicerone Press, which involved masses of research, in books, libraries and on the web as well as on the hills. I finally finished the writing just before Xmas and am now selecting the photographs. 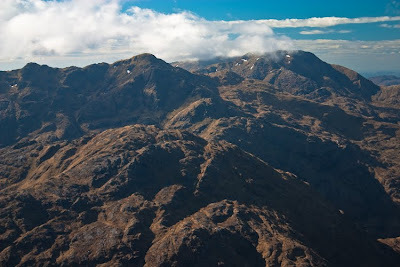 I also researched and wrote the Guide to Walks in the North-West Highlands for Aurum Press, which came out in 2007, and three little Classic Munros guides to Glen Coe, the Cairngorms and Ben Nevis and the Mamores for Colin Baxter Publications, which came out in 2008 and 2009. 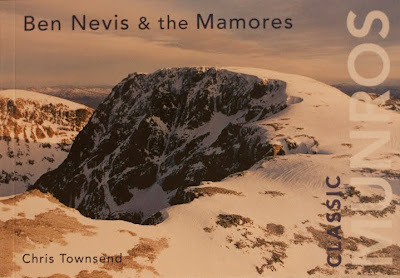 Once the final details of the Cicerone book are complete I’ll be working on further Classic Munros books (one on Skye is finished and should come out next year, then there’ll be one on the Southern Highlands) and a photo book on the Cairngorms. And of course I’ve written gear reviews in all 120 issues of TGO that appeared in the 2000s along with other articles and my current backpacking column. In my next post I’ll have a look at the gear that impressed me most and which I’ve gone on using. Photo Notes. During the 2000s I changed from film to digital. Initially I saw digital as a back-up to film with the convenience of easily downloadable images for the web. 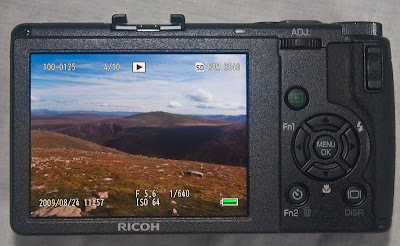 In 2000 I used a digital camera for the first time, a Ricoh RDC-5000 2.3mp digital compact camera, which I took on the Arizona Trail along with two film cameras. Pictures from the Ricoh appeared on the web (on the Bluedome outdoor site) but film ones were used for the book of the walk and in magazine articles as the quality was much higher. The photo here shows Picketpost Mountain and was taken with the RDC-5000 at 1/80@f6.7. The JPEG was processed in DxO Optics Pro. Film remained my main medium until 2004 when I bought a Canon 300D DSLR. For a while I still used film, often taking the same shot on film and digital, but slowly digital became the standard and film was used less and less. 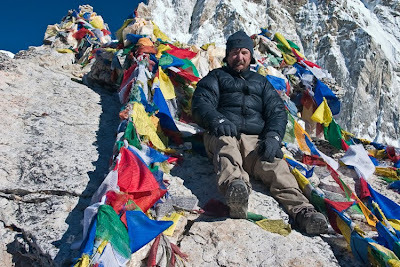 The middle photo here was taken in 2005 with the 300D on Kala Patar, the high point of the Everest Base Camp trek. The settings are 18-55mm lens at 33mm, ISO 100, 1/125@f9 and the raw file was processed in Lightroom 2.6. From the 300D I moved to a Canon 350D and stopped using film altogether and then my current cameras, a Canon 450D and a Sigma DP1. The last photo of the Wind Rivers in April 2009 was taken with the DP1 at ISO 50, 1/200@f8. The raw file was processed and cropped in Lightroom 2.6. One change that I think will come early in the next decade is a change in cameras. The 450D and DP1 both take excellent images but the former is quite heavy and bulky while the latter has a fixed 28mm lens, which I find limiting. Until 2009 high quality images meant carrying the bulk of a DSLR and lenses or the DP1. 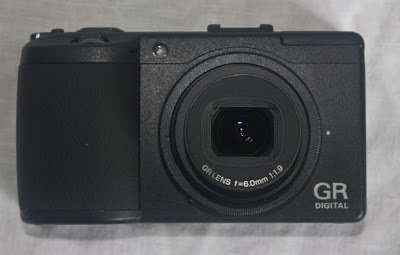 The introduction of micro four thirds cameras has changed this now and the Panasonic GF1 and the Olympus EP cameras offer high quality images and interchangeable lenses with less weight and bulk than a DSLR. I expect to be using one of these or similar on my next long walk. As the holidays begin and the year draws to a close I’d like to wish everyone a Merry Xmas and the hope for a good 2010. 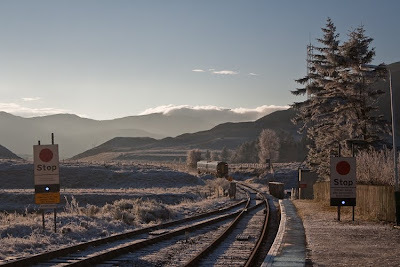 Here in Strathspey the snow is deep and the landscape in full glorious winter raiment. The track to my house is snowbound and the road into town icy and “passable with care”. Yesterday me and my younger step-daughter, who is home for Christmas, hauled supplies up to the house on a sledge and in heavy packs – the heaviest I’ve carried for a few years! And today we went skiing in the fields and woods, pushing tracks through the soft snow and admiring the drooping limbs of conifers heavy with snow and the fine tracery of ice and thin lines of snow on the birches. Across a dip in the fields Castle Grant rose grey and white, a sombre block of stone. 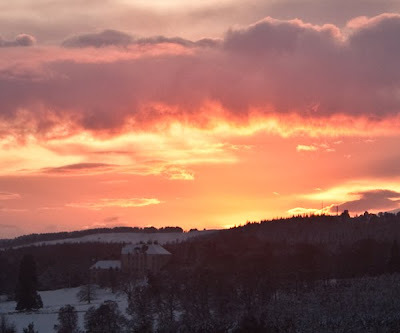 As the land darkened the sky above the castle glowed pink with a strange luminosity and depth. This intense brightness only covered a small area of sky. Elsewhere the sky was fading into a dull and chilly blue-grey. A quarter moon hung high above the trees. We have been watching Sherlock Holmes stories on DVD on recent evenings and Hazel remarked that the castle and the light looked just right for an episode. I thought it looked similar to the castle in the Dr Who episode “Tooth and Claw”. We listened for the sound of werewolves or sinister hounds but none came. Just the silence of nature on a cold winter’s night and the gentle swish of skis on snow. It was, as always, enough. Today I was interviewed by Euan McIlwraith about the threat to the Birks of Aberfeldy (see blog posts for November 12 and 22) for the BBC Radio Scotland Out of Doors programme. The piece should appear in this weekend’s edition. The programme is broadcast at 6.30am on Saturday and 11.05am on Sunday. It’s then available on BBC iPlayer for the next week. The latest news on the affair is that the councillor’s meeting due to be held today to make a decision has been postponed until sometime in the new year. The Aberfeldy Community Council had a local ballot three weeks ago and received over 200 responses of which 70% were opposed to the scheme. And at a meeting of the Community Council early this month there was a 54-4 vote against the scheme. Normally only 10-15 people attend these meetings. Clearly local opposition to the scheme is strong and becoming vocal. Today the Cairngorms were a frozen mountain world, a pale shimmering expanse of icy snow. All was held fast in the hardness of winter. Days of sun and nights of frost had thawed and refrozen the surface of the snow, turning it into a hard crust through which crampons and boots crunched satisfyingly. I crossed the Cairngorm Plateau to Ben Macdui revelling in the return of winter, the sharpness in the air, the piercing thrust of the north-east wind, the scouring of my face in the cleansing, abrasive air. Across the Lairig Ghru Braeriach and Cairn Toul were monochrome; just black rocks and white snow. Beyond them the sky held hints of pink and orange and yellow even in the middle of the day, the low sun of mid-December lighting up a thin layer of cloud. The clarity was immense and distant mountains stood stark and clear on the horizon. Only towards the coast, to the east, were there thicker bands of cloud. That way the snow comes, as it is forecast to do this next week. Few people were around on the mountains despite the fine conditions. I met only a handful returning north across the plateau and had the summit of Ben Macdui to myself. 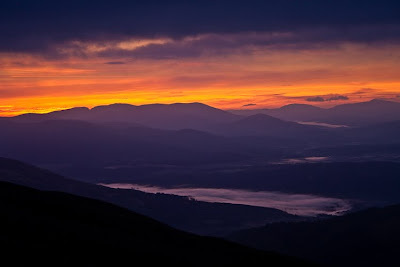 I turned back at dusk as the sky started to darken and colour and the sun slipped down behind the western mountains. 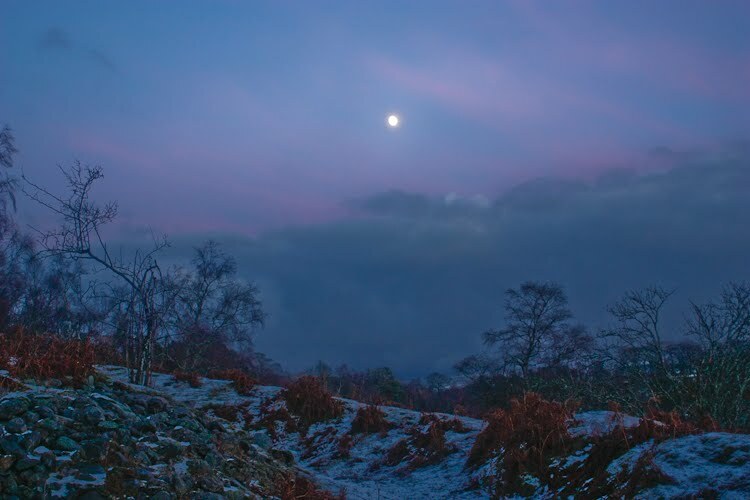 Cairn Gorm was an unreal dusky white with a soft pink sky wrapped round the summit. 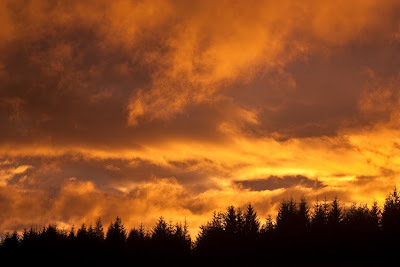 In the west the colours were harder and fiercer, bands of deep red, searing orange and greenish yellow streaking the sky. 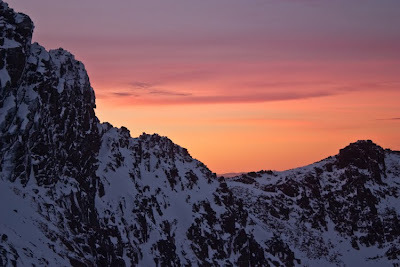 The constantly changing glorious sky stayed with me as I traversed the slopes of Cairn Lochan then climbed over Stob Coire an t-Sneachda where the last ice climbers were coiling their ropes. Only on the final descent did the light really start to fade and the black of night sweep over the mountains. The first stars were shining as I finally switched on my headlamp, removed my crampons and left the snow for a final walk down to the car park on a dry, frosty track. A real winter day at last. My backpacking columns that have appeared in TGO magazine this year are now available on the new TGO website, which is being updated every day. Topics include backpacking and wilderness, wild camping, solo backpacking, long distance backpacking, the Pacific Crest Trail, camping on summits, the pleasures of camp cooking and off-trail hiking. You can find the columns here. With the UN Climate Change Conference taking place in Copenhagen over the next two weeks the coverage of global warming in every type of media from blogs to newspapers is growing louder and more vociferous by the day. On the surface there appears to be a debate going on as to whether global warming is taking place at all and if it is whether human beings are in any way responsible. However when you look at what the experts say, the scientists who have studied this for years, then the vast majority say the climate is warming and that human activity is at least partly responsible, which means we can do something about it by changing out activity. All the major scientific organisations and societies worldwide are in agreement on this. Now, I’m not a climatologist or indeed any sort of scientist but when there is near consensus on something I think it is sensible for non-experts like me to accept it as true. 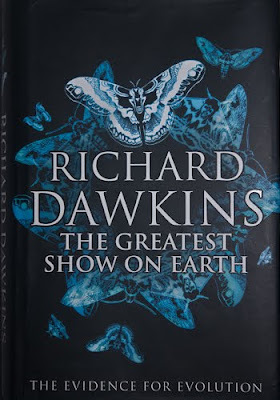 The idea that all these different scientists and organisations could be part of some vast conspiracy to con the public into believing global warming was happening just seems ridiculous. Of course the science isn’t absolutely proven, nothing scientific ever is, but it is extremely unlikely to be wrong. I’ve been following the global warming story for many, many years due to my interest and concern with conservation and the environment. It has not been a happy journey. There used to be agreement between conservationists and environmentalists on almost everything. Not any more. Enviromentalism now means global warming before everything. Groups like Friends of the Earth were hailing as a great victory for conservation the defeat of a proposed quarry on the island of Harris. 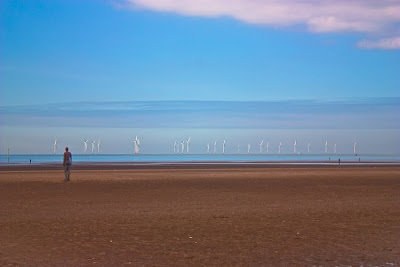 Now they are in favour of giant wind turbines stretching mile after mile in the same place. Anything that can be seen to do something to combat global warming, however miniscule, is justified to environmentalists regardless of any other damage it may do. The idea of wilderness and nature having any value has gone. 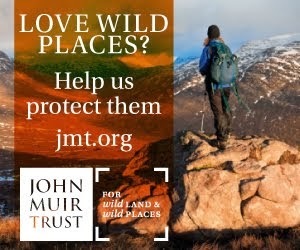 FOE founder David Brower, who spent much of his life fighting for wilderness protection and restoration, would be horrified to discover the group now favours industrialising wild places. I used to support groups like FOE. I find it hard to do so now. And when an environmental activist like George Monbiot calls for wind turbines on top of every hill in Scotland I think people like him are enemies of wild places and therefore my enemies too. Global warming threatens humanity as we live at present, in our ever burgeoning numbers, and the natural world as it exists now. It does not threaten the planet or life in general. But it could wipe out many species and habitats as well as ruining our lifestyle. So I do think action needs to be taken. But that action must not also wipe out species and habitats. Environmentalists say that covering the hills in wind turbines, roads and power lines is necessary because otherwise the hills will suffer due to global warming. So destroying them now is okay because if we don’t they’ll be destroyed in the future? No, this is not okay. The price for combating global warming cannot be the trashing of wild places. To do so would be to so diminish the world that it would not be worth saving anyway. 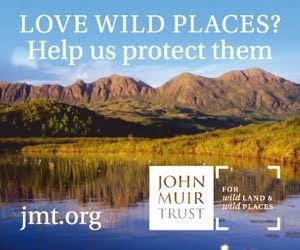 If wild places, the environment we come from and depend on, cannot be saved then what can? Wilderness, I truly believe, is essential to the human spirit. It’s not an add-on, not an option. We need it. TGO has just launched its new website with a host of interesting material. Still in beta form, the website isn’t fully populated yet but there’s still plenty there including some of my gear reviews that have previously appeared in the magazine. Brand new are some videos that I made with Cameron McNeish last summer. 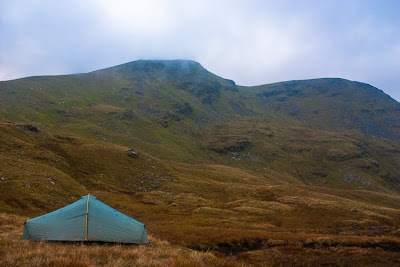 These cover types of shelters, selecting a campsite and some of my favourite gear. There’s also a piece on minimal impact by me and Cameron. My backpacking columns will appear too, with, eventually, some new material, and there should be more videos. The old TGO forum and community section hasn’t been transferred to the new site yet but this should be done fairly soon. The website looks excellent and should turn TGO into a multi-media venture, which I think is essential these days. Pulling all the different media strands together has required hard work and I know that Cameron and Deputy Editor Emily Rodway have been putting in long hours for several months getting the website up and running while still putting together the paper magazine. 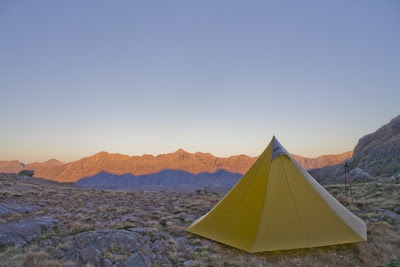 Photo: two of my favourite pieces of gear that appear in the TGO video: Hilleberg Akto tent and Caldera Cone stove. Canon 450D, Canon EF-S 18-55 IS@18mm, 1/200@f8, ISO 200, raw file converted to JPEG in Lightroom 2.5. The January TGO has just appeared (yes, I know December has only just begun but that's how magazines work -it just seems even more bizarre than usual at this time of year). 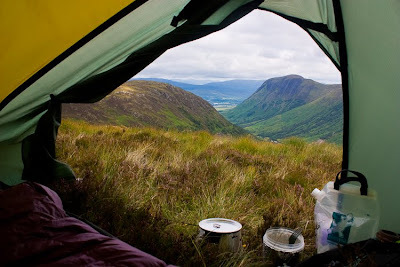 My backpacking column is about the Pleasures of Camp Cooking. However despite the cover description of me as "Backpacking's Naked Chef" you won't find any exciting recipes in it! 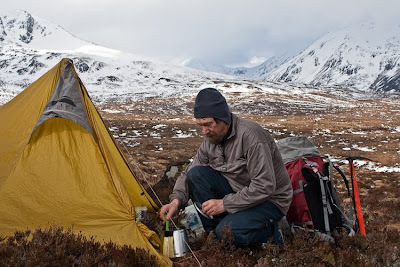 Rather it's about the simple joys of basic hot food and drink in wild places. 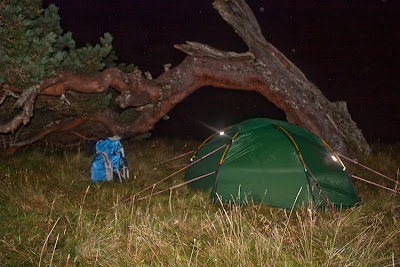 In the gear section I review 15 LED headlamps and Paramo's Velez Adventure Light Smock. Other reviews are lightweight fleece by John Manning, gaiter modification by Eddy Meecham and reviews of the Berghaus Liskamm down jacket by Cameron McNeish and the Rab Vapour-Rise Trail Jacket by Judy Armstrong. Elsewhere in this issue interesting features I haven't read yet look to be The Perfect Snowstorm by Andrew Terrill about a snowy trip in the Peak District, Three Peaks Friends and Foes by John Manning about plans for the maintenance of the Three Peaks Walk in the Yorkshire Dales, Way Out West by Dan Bailey on the wonderful mountain Ladhar Bheinn in Knoydart, the Unending Quest by Peter Gillman about the frustrations of Munro bagging from London and Picos and Pongos by Stephen Venables about the mountains of Northern Spain. There's also the Wild Walks section, pieces on cross country skiing and safe winter walking (both appropriate as the first snow falls in the hills) plus the usual columns from Jim Perrin and Roddy Womble. For the first time this autumn I looked out this morning to see a scattering of snow covering the ground. Most years this happens a month or more earlier but this wet and warm autumn has had little suggestion of winter until recently. Today was definitely wintry though with the temperature hovering around zero and squalls of snow and hail blasting in on a cold north-east wind. Thick clouds lay low over the hills and the sky was dark all day. 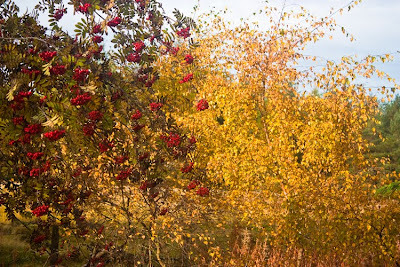 Walking round the local woods and fields I felt the landscape was on a cusp between autumn and winter. The falling snow melted almost instantly on the trees and the sodden ground, only sticking on drier slopes and low vegetation. But with each shower a little more whiteness crept over the land. 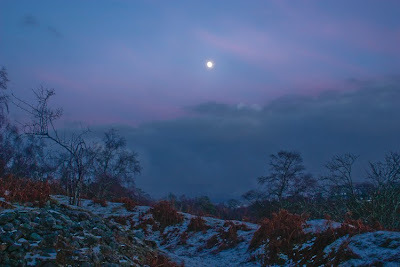 At dusk – 3.30 pm at this time of year – the ground began to freeze and there was the familiar and satisfying crunch of frosty ground and refrozen wet snow under my boots. An almost-full moon hung in the sky as the thick clouds parted. For a few minutes a subtle pink with hints of purple suffused the sky but the dense clouds to the west soon blocked the last rays of the sun. I tramped home delighted with this first touch of winter. And the forecast is for more snow. 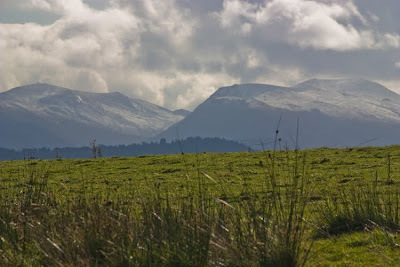 Snow is lying in the Cairngorms, maybe down to around 900 metres. I could see it glistening below the ragged edges of the clouds as I drove north to Inverness to give a talk on my Wind Rivers ski tour of last April to the Inverness Nordic Ski Club. Earlier, while selecting images for the talk I reflected on the last snow season and how marvellous it had been with heavy snow in Strathspey in February that enabled me to ski from my front door and camp on a nearby hill (see A Camp In The Snow, February 10 2009) as well as ski and snow shoe in the local woods and high in the Cairngorms. 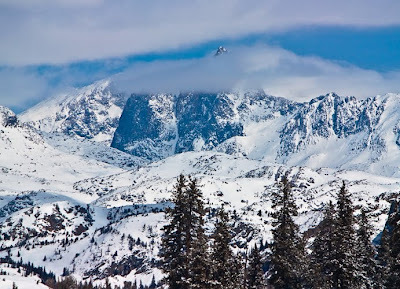 Then there had been the spring finale in the wilderness of the Wind River Range, living in igloos and skiing through the vast forests and rolling foothills with the alpine peaks rising on the horizon. What a joyous time it had been. Recently though it has felt very different. The wet but mild weather of this autumn with low clouds shrouding the hills, sodden ground and a general greyness to the landscape has not been very inspiring and I have not felt any excitement or desire to go up into the mountains. 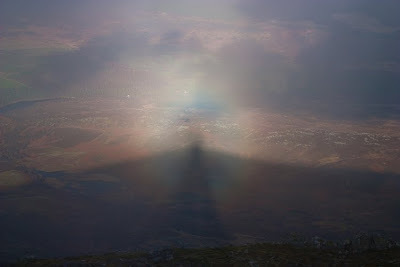 The magic of the Brocken Spectre on Schiehallion (see post for November 15) was wonderful but that came on the summit and I’d had no feeling of anticipation when I set out. But seeing the snow has kindled a spark. The hills have changed, the winter has begun. And more snow is forecast. Of course this snow will melt and the hills could be bare again in a week or two but just the sight of it has been enough to have me thinking of the first winter trip and wondering whether there will be enough for skiing or whether it will be a walk with ice axe and crampons. Having just returned home from two weeks in Aberfeldy during which I walked round the Birks of Aberfeldy twice and along the lower Birks into the town almost every day I was astonished to learn that the dramatic ever-changing waterfalls and rushing Moness Burn are threatened by a hydro scheme that would greatly reduce the flow of water. If this goes ahead the falls would be much less impressive and the huge variations in water volume that make the river constantly different would be far less. That this could even be proposed is shocking. That the Council planning committee has approved it is astounding. 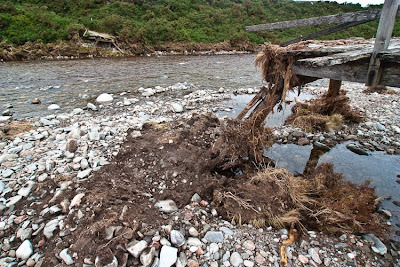 Even if these people have no feel or appreciation of nature and beauty do they really want to damage the main attraction that brings visitors to their town? That the water flow makes a huge difference I saw every time I walked beside the Moness Burn in the Birks and it’s reflected in the two photographs to the left, which were taken from the same spot, the left one on November 11, the right one on November 19. It could be a different river. Losing this variety would make the Birks a poorer, tamer place. 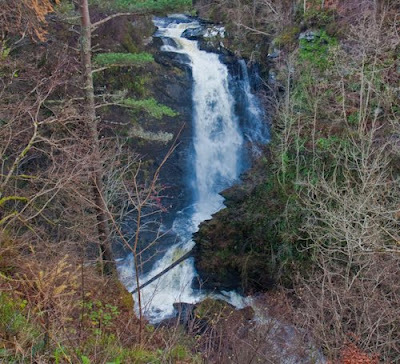 The Birks of Aberfeldy is one of my favourite woodland and waterfall walks in Scotland. 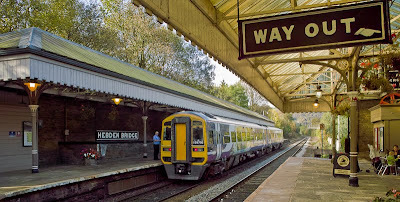 I will not go there again if the hydro scheme goes ahead. It would sadden me to see the river controlled and the waterfalls restrained. The Birks is owned by the local community and part of it is a Site of Special Scientific Interest. The latter would be damaged by the reduction of humidity caused by a lower flow of water, as would the whole of the ravine. Without the variations in flow with spates and dry period the natural history of the Birks would change. 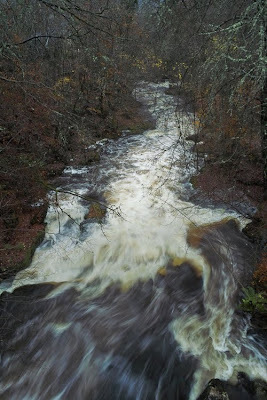 Photo info: left, the Moness Burn on November 11, Sigma DP1, 1/30@f5.6, ISO 200. right: the Moness Burn on November 19, Sigma DP1, 1/6@f5.6, ISO400. Raw files converted to JPEG in Lightroom 2.5. The Birks of Aberfeldy walk ends right in the centre of Aberfeldy, where it was just a short stroll to The Watermill cafe and bookshop and a warming mug of hot chocolate and restorative slice of sticky flapjack. The Watermill, which is in the old Aberfeldy mill, is a wonderful relaxing place where you can browse the latest books and have a tasty lunch. At the end of a cold November walk it's very welcome indeed. 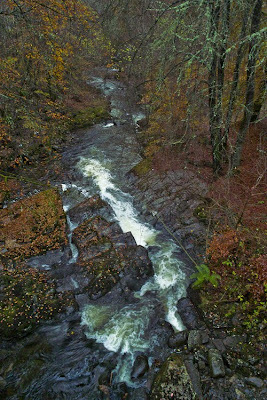 Photo info: the Moness Burn in the Birks of Aberfeldy, November 2009. Sigma DP1, 1/30@f5.6, ISO 200, raw file converted to JPEG in Lightroom 2. Finally in this warm and wet autumn, typified by low clouds, grey skies and rain, the air cleared after another day of rain, the stars and moon appeared and the temperature fell below freezing. The next day dawned with an unfamiliar sharpness in the air and thick white frost coating the ground. In the distance a dusting of snow lay on the lower fringes of the still cloud-capped mountains. 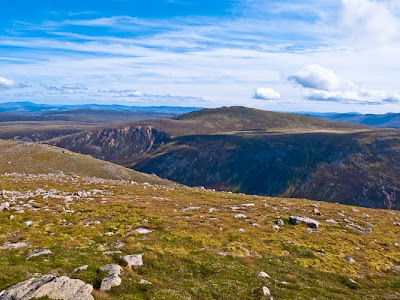 Spurred by the sunshine I set out on one of my favourite short walks in the Cairngorms, from Glenmore through Ryvoan Pass and up Meall a’Bhuachaille. The walk through the Glen More pine forests is always lovely, with its mix of ancient gnarled giants and crowded young saplings. New trees are now springing up in the plantation areas cleared some years ago and these ugly scars are slowly greening over. Above the forest on the glen floor more young trees are also advancing up the steep slopes of Creag nan Gall and Creag Loisgte. 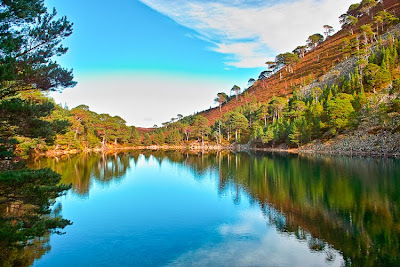 Sandwiched between these rocky hillsides is lovely An Lochan Uaine – the green lochan. Living up to the name the lochan reflected the pines on its shores, its surface shimmering slightly in a hint of a breeze. Beyond the lochan the trees fade away as the path climbs gently through Ryvoan Pass to little Ryvoan Bothy. Here I climbed more steeply, up the slopes of Meall a’Bhuachaille. The bright sun was surprisingly hot and I had my jacket off, sleeves rolled up and shirt collar unzipped. Suddenly An Lochan Uaine was a dark slash far below me, half-hidden by heathery slopes. Above the lochan the woods and hills rose to the high Cairngorms, an undulating brown and green landscape capped with a touch of snow. On the summit a cool westerly breeze ensured the jacket went back on again. Below the huge sweep of Glenmore and Rothiemurchus Forests stretched out below the mountains with the silvery waters of Loch Morlich standing out amongst the dark pines. Further west the sky was dark with clouds. By the time I was back down in the forest these were overhead and the sunshine had gone. But for a few hours it had been wonderful to walk in warmth, brightness and colour. It is easy to forget during days of rain and cloud just how the sun can transform the world. 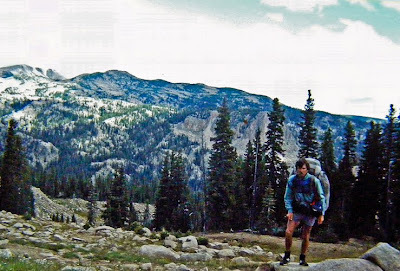 This year I’ve written three pieces for Rohantime about Rohan and the clothing I used on long distance walks in the late 1970s and the 1980s – Land’s End to John O’Groats, the Pacific Crest Trail and the Continental Divide Trail. These pieces have now been gathered together on Rohantime and I’ve written a short Introduction about Rohan and how the innovations they introduced back then – stretch “soft shell” fabrics, thin lightweight windproof fast drying clothing, thin synthetic insulation – and for which they were mocked by some in the outdoor industry are now mainstream. Paul and Sarah Howcroft really did revolutionise outdoor clothing. The pieces can be found in the Rohan Flashback section of Rohantime under the heading Rohan – Back to the Future. Photo info: On the Continental Divide Trail below the Chinese Wall in Glacier National Park, Montana. 1985. Pentax MX, Tamron 35-70 lens, Kodachrome 64 film. No exposure details. Scanned slide tweaked in Lightroom 2.5.